take the next step by starting your own independent democratic ED practice? Download this whitepaper to get all the steps that will ensure your success as you go out on your own. How do you break away from the group and start an emergency medicine practice? along with the necessary steps to ensure your success. 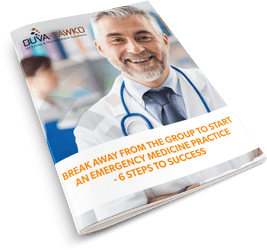 Learn how to develop a strategy that will guide you, your partners and investors into a successful Emergency Medicine Practice. Learn how to establish internal partnerships that are rewarding and ultimately take your new Emergency Medical Practice to fruition. Learn how to become well-versed and in compliance with your state's health care laws when launching your new practice. Learn how to start the State Licensing process, NPI (National Provider Identifier #) process and credentialing at the hospital, and with payers. Learn how to avoid large amounts of debt, create well-thought out operating budgets and the options of small business loans vs. private investments. Learn how Emergency Medicine Billing Management specialists can ensure that all aspects of you new business venture is sound and successful.